If your ancestors immigrated to the United States from Europe, you’ve probably got a family story about how your family name was changed at Ellis Island by overzealous officials. I can understand why this myth endures, but it needs to die in a fire. My great grandma Nell was born in County Mayo, Ireland. Her parents were Walter Basquill and Bridget Burke (also spelled Bourke). 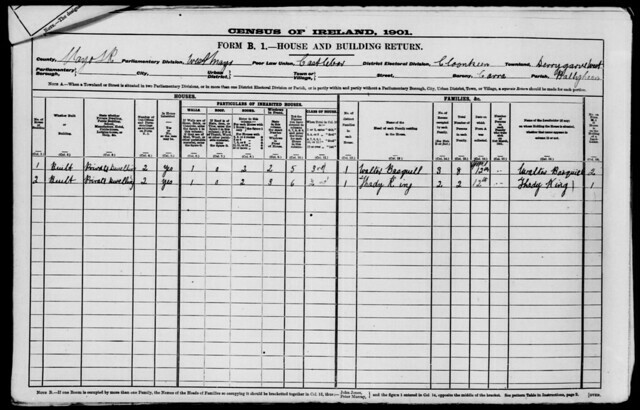 According to the civil register, she was born 22 Apr 1895 and the birth was registered on 3 Jun 1895. She was born at home, in Hollyhill, in the parish of Ballyhean. 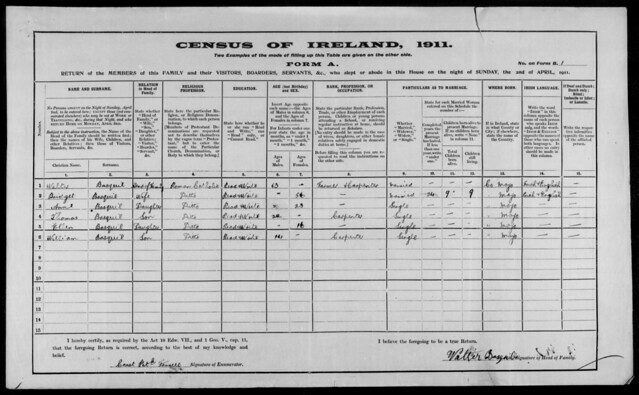 In both the 1901 and 1911 Ireland censuses, she is identified as Ellen, with the latter census dropping the last “l” from her surname. In 1916 she came to the United States on the Philadelphia. 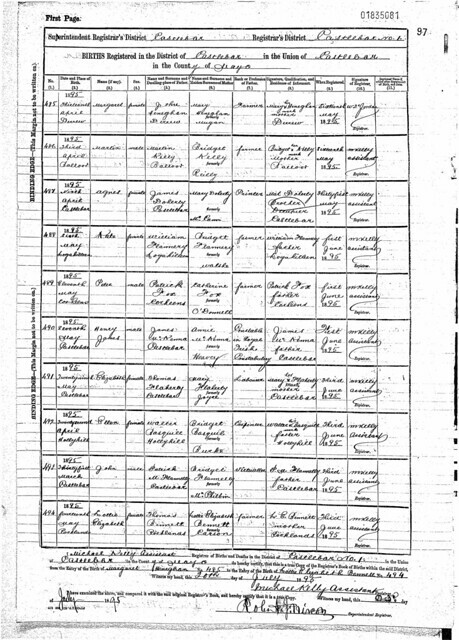 On line 7 of the ship’s manifest, she was identified as Ellie Basquil. 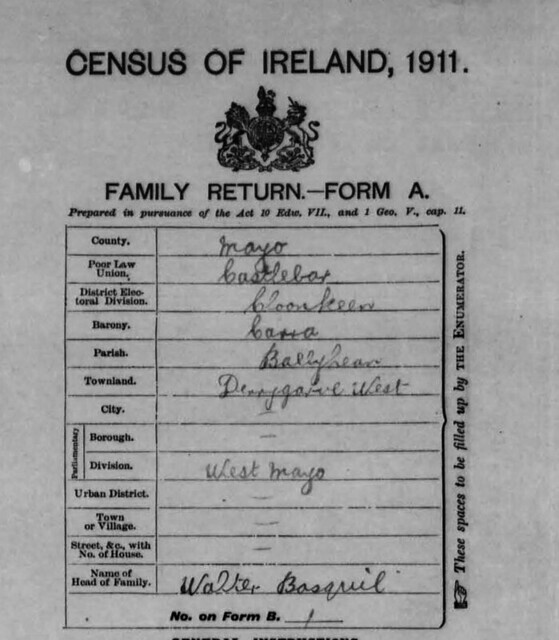 I know this is her, because the last column lists her father, Walter Basquil of Ballyhean (a small parish near Castlebar, in County Mayo). 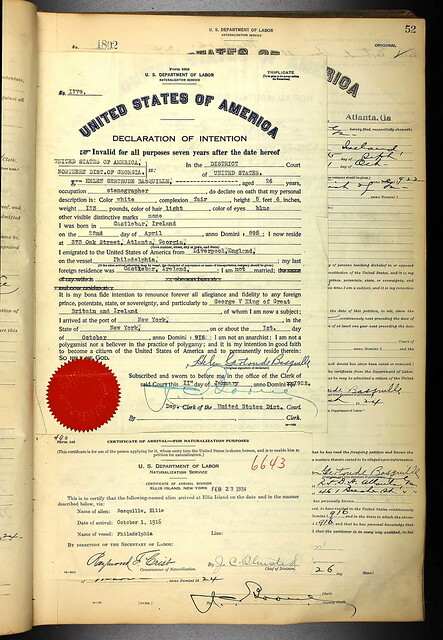 When she made her petition for United States citizenship in 1922, she was going by the very proper name of Helen, middle name of Gertrude, and had added a fancy “e” to the end of her last name. And, in fact, I can find no evidence that she ever used the names Ellen or Ellie after she arrived in the US. But though her name did in effect “change” after she immigrated to the US, it was not changed at Ellis Island. The officials at Ellis Island (and other ports of entry) did not provide any sort of official identity papers to the immigrant. They simply checked the immigrant’s name against the ship manifest. The information on the manifest was provided by the immigrant when they purchased their ticket. Meaning, any mistakes in an individual’s name were a result of bad self-reporting by the immigrant, or they were the fault of a shipping clerk at the port of departure, or they weren’t mistakes at all, but were deliberate changes made by the immigrant. Obviously, mistakes happened, but even then, it wasn’t a big deal. The immigrant was not forever tied to that spelling. They were free to ignore, change, or correct it at any point. What did happen is that immigrants themselves changed the spelling of their names. This is the rule the world over, when people migrate and reinvent themselves. Some were looking deliberately for a new start, and a new name went along with that. They likely, historically, did not come from a place that was precious about the spelling of names. 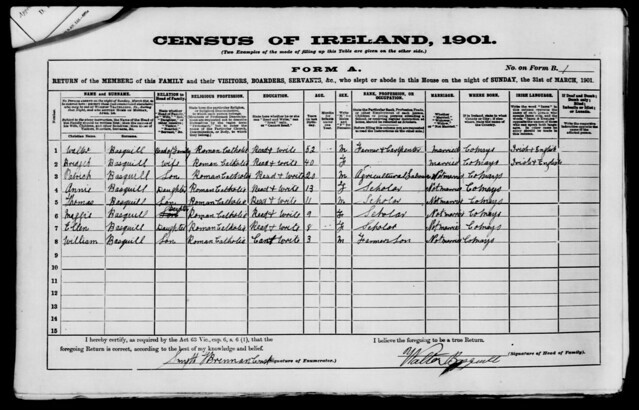 They may have been illiterate and at the mercy of priests and clerks to spell their names for them, but even literate folks (and you can see from the Irish censuses that great grandma Nell could read and write ) were not necessarily attached to a particular name spelling. 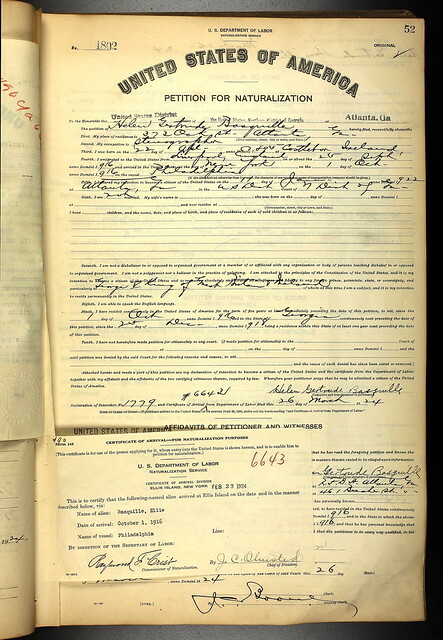 Note that on Nell’s Petition for Naturalization, her name is spelled Helen Gertrude Basquille. 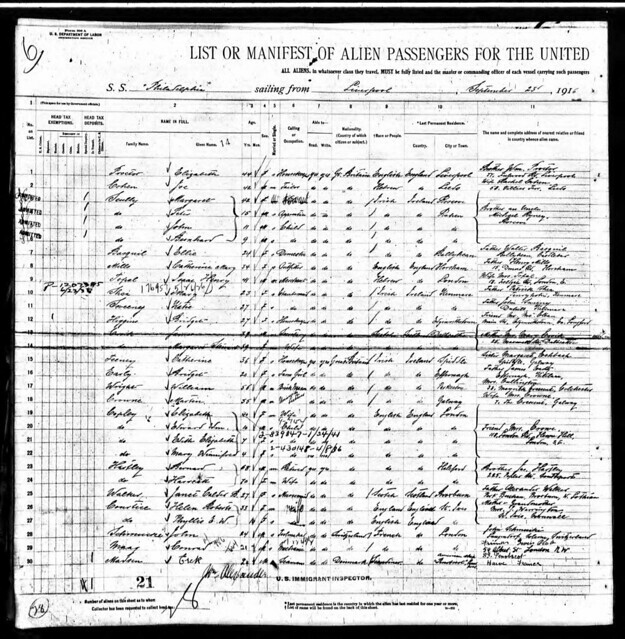 But there is a tipped in Certificate of Arrival recording the spelling used on the ship’s manifest. She just had to provide evidence that she arrived in the US legitimately. Not even the United States government cared what name she came here under. 1. Basquille is a perfectly legitimate spelling of the surname, from the very beginning, and is still in use today. 2. Family legend had it that Nell could speak only Gaelic when she came to the US, but that’s clearly nonsense. Her parents spoke Irish and English, but by the time Nell was born, Irish would not have been something young folks were routinely taught, even in Mayo. Whether she spoke Irish, or to what degree if she did, we’ll never know. She certainly spoke English, though. 3. There are numerous ways to spell this surname. I’m thankful that great grandma Nell only availed herself of three of them: Basquill, Basquil, and Basquille. I believe the switch from Ellen or Ellie to Helen was simply an indicator that Nell had grown up, was independent, and was starting a new life. She chose to alter her own name.